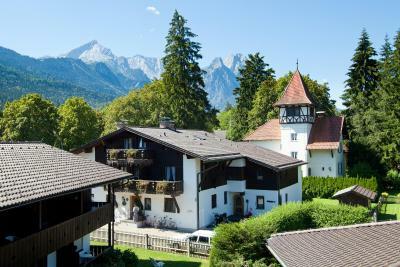 Lock in a great price for H+ Hotel Alpina Garmisch-Partenkirchen – rated 8.4 by recent guests! 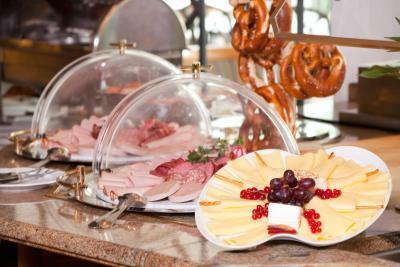 Breakfast and all hotel facilities. The hotel has pool which is good. Really like the view from hotel restaurant. 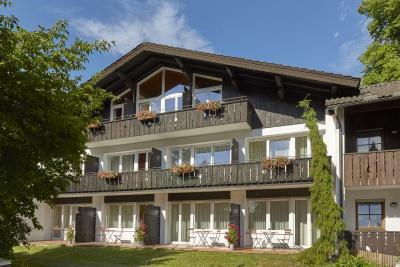 Lovely location within walking distance of town center. Rooms good sized and clean with balconies or terraces. Breakfast buffet was good and discount cards for local transport and businesses were much appreciated! Location staff and value of money. The hotel was really great and amazing view really love to go back. 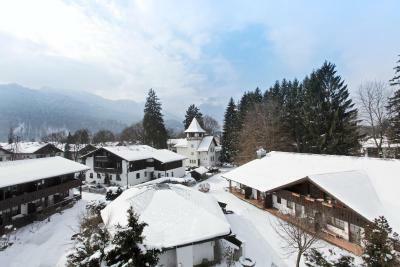 Its my second time in this hotel,every think is great,rooms,staff,breakfast,cleanness,indoor pool,recommended for staying in Garmisch-Partenkirchen. Friendly Staff, refrigerator, in room. Nice view from Balcony. Nice Hotel with good location for skiing. The location was my favorite part. We were a 10 min walk from the entrance to the skiing area, and there was a ski equipment rental right across the street. It also had a top notch breakfast. Helpful staff, plenty of amenities on site (you can purchase lift tickets there for example), within walking distance of ski rentals, lifts, and the Aldstadt. 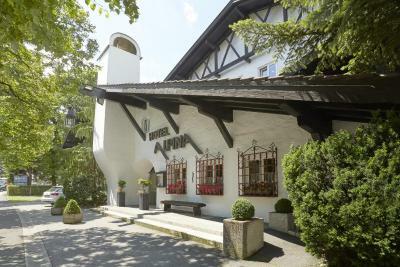 H+ Hotel Alpina Garmisch-Partenkirchen This rating is a reflection of how the property compares to the industry standard when it comes to price, facilities and services available. It's based on a self-evaluation by the property. Use this rating to help choose your stay! One of our top picks in Garmisch-Partenkirchen.Located in the winter sports resort of Garmisch-Partenkirchen, H+ Hotel Alpina Garmisch-Partenkirchen offers modern rooms, a daily breakfast buffet and an indoor heated pool. The Olympia Stadium is 2,650 feet away. 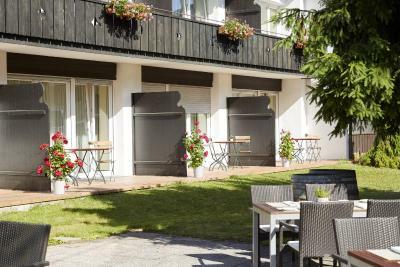 Decorated in bright color schemes, the H+ Hotel Alpina Garmisch-Partenkirchen's rooms have satellite TV channels and a balcony or terrace. 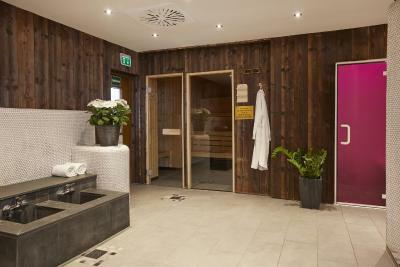 Guests can use a variety of spa facilities on site, such as a Finnish sauna, a Roman steam room and an indoor pool. Massages and beauty treatments can also be booked. 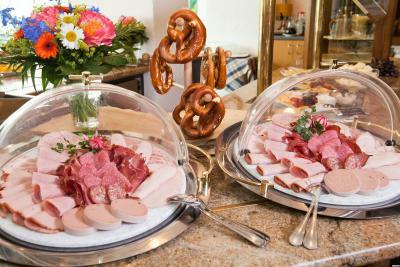 The country-style Kaminzimmer Restaurant features a fireplace, and offers German cuisine and fine wines. In summer months, meals are served on the terrace. 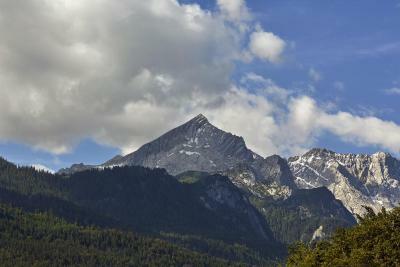 Garmisch-Partenkirchen Train Station is an 8-minute walk from the H+ Hotel Alpina Garmisch-Partenkirchen. 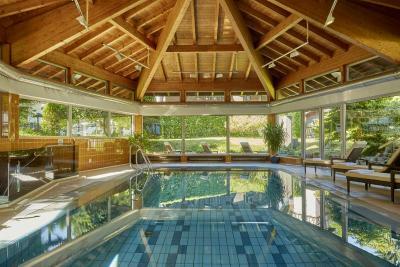 When would you like to stay at H+ Hotel Alpina Garmisch-Partenkirchen? 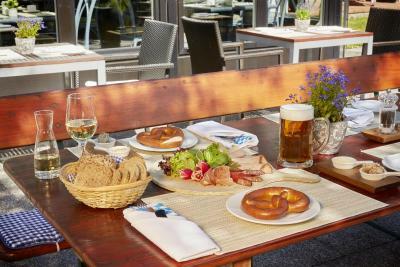 Warmly decorated, spacious room offers satellite TV and a balcony with views of the surrounding Bavarian countryside. Spacious double room with a double sofa bed. Guests should let the hotel know how many children they are arriving with and their ages so that beds can be set up accordingly. Please note that the indicated price is for two adults and children pay extra in accordance with the hotel policies. Bright suite featuring a balcony and panoramic view of the quiet garden. Includes a minibar, satellite TV, and private bathroom with hairdryer. This room also includes free Wi-Fi. 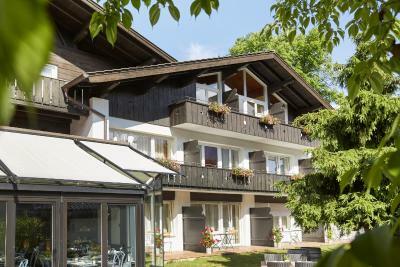 House Rules H+ Hotel Alpina Garmisch-Partenkirchen takes special requests – add in the next step! 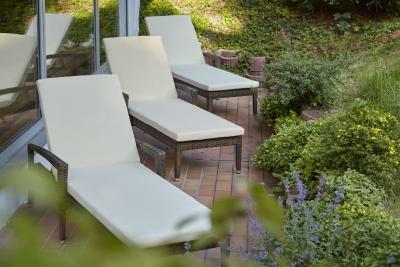 Up to three children from 7 to 12 year are charged EUR 19 per person per night for extra beds. Up to two older children or adults are charged EUR 56 per person per night for extra beds. H+ Hotel Alpina Garmisch-Partenkirchen accepts these cards and reserves the right to temporarily hold an amount prior to arrival. We got the corner room by the street. So it was a bit noisy. No iron board, no ironing equipment & no safe in the room. The breakfast was super good and also the shower it was with a good comfortable pressure. Also the view was amazing. Also previously when i did send some email to the hotel regarding some inquiries they were highly effecient in replying back. The breakfast was excellent. It had a wide variety for everyone's choice. The room had a beautiful view of the mountains and the garden which welcomed us in the morning. The bed was very comfortable and the restaurant was very good and cosy. 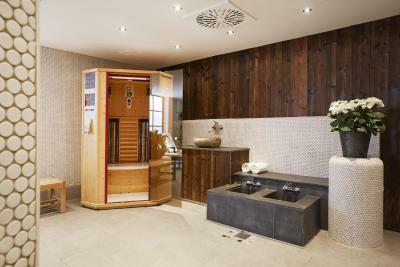 The spa with the sauna and steam room was excellent too and very relaxing in the evening. And all the staff was very welcoming and helpful. We came for dinner at 9 pm and the waiter was rushing everyone to remind that they close at 9:30. 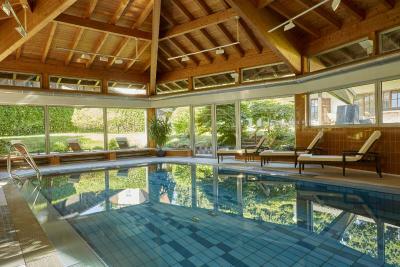 Very nice room, pool and sauna area - really helpful after a sporty day. Great breakfast. Sweet little garden inside the territory. Rooms slightly outdated but still nice. Good location ! 10 min walk to bottom of slopes or shorter bus ride. Also 5 min walk into Main Street - variety of restaurants. 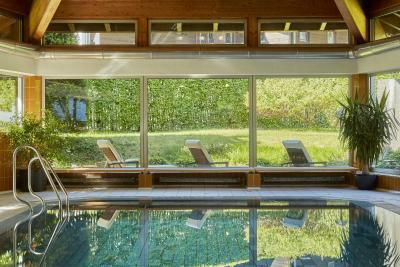 Good facilities - pool and gym available. Staff very friendly. Excellent breakfast selection. Room nice, good view from balcony. Eventually, something in the furniture should be renewed, but everything was clean and comfortable anyway. 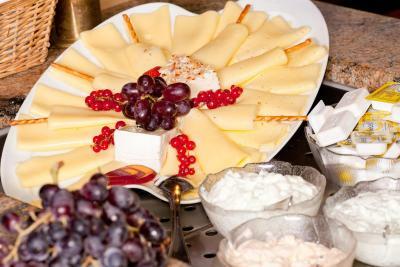 Nice Breakfast...Nice free services as swimming pool, sauna, etcetera. Good customer care. Free WiFi.